Apple Preparing to Offer iPad Engraving? Erictric reports that Apple may be preparing to allow iPad customers to have their devices engraved with a message of their choosing, with the new option possibly set to launch for the holiday shopping season. The tip comes from an anonymous Apple employee, although it is unclear in what capacity the source works at the company. "From what I understand, Apple's going to be offering customers the option to get their iPads engraved just before the Holidays roll around," noted the source in an email to me, which oddly enough began on the topic of Apple's recent move to distribute free bumpers and cases for iPhone 4 smartphone customers. Our source cites that current high demand for the iPad has prevented Apple from offering tablet engraving, fearing slow-downs in production. 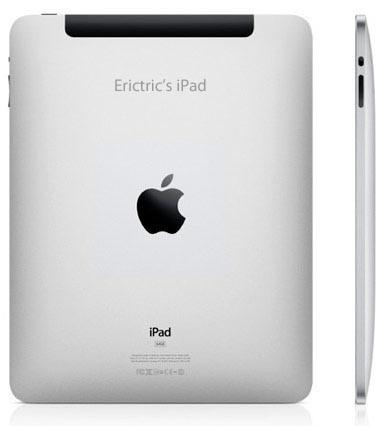 Pricing for the rumored iPad engraving is unknown, although it is presumed to be free based on the company's existing iPod engraving program. Apple initially launched iPod engraving with the original 10 GB iPod in March 2002. Engraving was initially priced at $49, but was made free and extended across the company's expanding iPod line in subsequent years. Erictric has not typically been a source of Apple rumors, so we have no track record to assess the veracity of its claim. Taken at face value, however, an iPad engraving program would seem to be a reasonable addition for Apple as supply constraints begin to ease.